Sharp. Tearing. Never ending. Some days, that’s my pain. When I open my eyes and start to move slowly in my bed, there it is — the reminder that somewhere, something will hurt today. There are days when the weather is warm, the light pours in through the windows, and I wake up and don’t move as I soak in the comfort of this moment. Sometimes I stall getting out of bed, hoping for a few more minutes of this loveliness. Those days I’m thankful for sleeping through the night, waking up rested. I know this is a rare thing, and I’ll appreciate it while I can. My diagnosis wasn’t easy to come by, Lyme Disease. I had hoped for something curable, something that as a 20 something, I could treat and move on. This wasn’t the case. Now I live a life of treating symptoms and challenging my diagnosis. When I bend my finger, just one… my right pointer finger, I feel the pull and ache. It’s tight, not terrible, just uncomfortable. Today I’ll need some CBD oil salve to ease the ache since I’m a writer and that finger is essential to me. I can rub it into the places that hurt, and in a few minutes, the pain settles down. As of 2018, there are a total of 46 states where CBD is legal with a prescription for medicinal usage. I’ve become an advocate of holistic medicine and CBD. That wasn’t always me. I’m a rule follower. I didn’t have my first drink until my 21st birthday and didn’t have another til many years later. I don’t speed. I use the crosswalks. Moreover, I had never tried marijuana until I was 41 and only after my doctor suggested it. When I moved to Washington state; a recreational marijuana state, access to herbal pain treatments became easy. More doctors and medical professionals are looking to CBD oils as a treatment option for inflammation, cancer, and pain. People looking for a more holistic approach to pain relief can turn to CBD.
. I personally love Joy Organics because they have full spectrum and organic CBD – Many CBD companies use isolates in their CBD products. Which provide some benefits of CBD but you will miss out on the range of cannabinoids and terpenes that a full spectrum offers. Joy Organic products contain all of the cannabinoids found in our proprietary strain of hemp. You receive the full synergistic impact of multiple compounds working together. Through the years I have had so many prescriptions for pain relievers, tried acupuncture, meditation, heat, cold, and more. My liver suffered from the drugs, but without them often I couldn’t move from my bed because of the Lyme Disease. 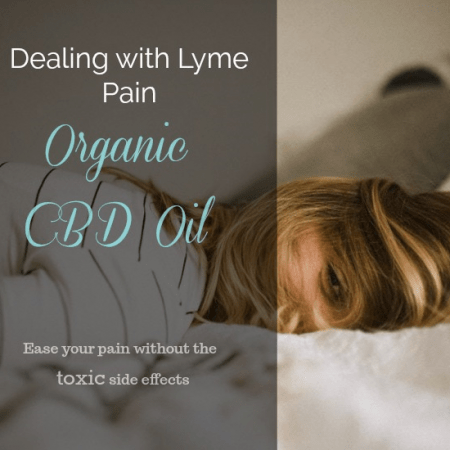 But after using CBD regularly for over a year, I am living a full life without the heavy burden of Lyme. I didn’t want to get high. I don’t like feeling out of control. I needed to try something else, and I’d spent months reading about the benefits of CBD oil and how it has helped so many people just like myself to relieve pain and reduce inflammation. That’s what I said to the young man behind the counter at the dispensary. I didn’t know what I wanted, or how to use it. I needed help. I was scared walking in the door the day that I decided to try marijuana. There was no judgment or looking at me strangely. Just information about how to take it slow, learn about the milligrams, edibles vs. smoking and what exactly is a vape pen. He directed me to start using CBD oil so I wouldn't have any of the “high” effects and just inflammation relief and pain reduction. The added benefit was my anxiety settled down too! Since I have begun my journey of learning more about CBD, I have learned that I don’t like smoking, my lungs are already damaged from reoccurring pneumonia. However, topicals help my joint aches without any other side effects. I've discovered that I can use low dose CBD capsules in place of liver damaging naproxen and it can help restore my liver. I also love that I can use a hemp vape anytime during the day for almost instant relieve and have no “high” side-effect. CBD works within the endocannabinoid system in your body. That biological system serves important roles in the human body. This system is crucial for regulating our physiology, mood, and pain levels. I talked with each of my kids about my use, and I feared their judgment or their reactions. But they understood, and they supported my fight. My kids grew up seeing me in pain, watching me feel sick because of the meds that I needed. Talking with my family about my needs helped me to come to terms with feeling like I wasn't a good role model. Surprisingly they all had great suggestions on how they thought I could feel better and wanted to be a part of my battle against Lyme disease. I needed to let them in. Choose what you can live with. I don't smoke, but I do have a cold vape pen that I love. I love tinctures in my tea, rub on my joints. I also use capsules to help me sleep at night do help me to live a better life. I still wake up in pain most days. Then I make my way to the bathroom and start my routine to feeling better and CBD had given me back my life. Want to try CBD? Take this discount code and see for yourself and let me know how it goes! Use the code: Firefly and take 10% off.